When you think of the term ‘sommelier,’ what image generally comes to your mind's eye? If it‘s an antiquated image of a dapper, middle-aged white man spinning and sniffing a glass of fine wine with his pinky finger held high, then a quick Google image search will confirm your perceptions. For so long that’s been the reality of the French wine scene. One of the faces that you won’t so easily find populated among your search results is Chicago native, Parisian wine sommelier, Tanisha Townsend. Townsend, now a resident of France, is a former full-time information security consultant who found herself at a crossroads a few years back. Torn between the comfortable life that the infosec field had already afforded her, in contrast to her passion: a rare opportunity to teach a wine & spirits course at a business school in Paris, France. Pretty simple right? Needless to say, the latter ended up paying off. Since her debut into the Parisian world of wine, Townsend has amassed an impressive array of certifications, including Certified Specialist of Spirits (CSS), Certified Wine Specialist (CSW), Certified Spanish Wine Educator, French Wine Scholar (FWS) among others. I’m Tanisha Townsend, Chief Wine Officer of Girl Meets Glass. I’ve studied wine for several years and hold the WSET Level 3 and Certified Specialist of Wine & Spirits certifications. I currently live in Paris, France where I’ve been for 3 ½ years teaching wine courses, hosting wine tours and tasting my way through the French wine regions. What is GirlMeetsGlass and how’d you come up with the idea? Girl Meets Glass is a wine & spirits lifestyle agency. Meaning that more than just wine tasting, it’s how you pair wine with food, how to properly serve spirits, wine tourism... I help to make wine & spirits a part of your life. Girl Meets Glass actually started solely as a blog. I was working in wine marketing, and taking wine certification courses while living in DC and started being asked to host tastings. During my tastings, I noticed I’d get the same questions and concerns over and over. I figured that more people wanted/needed this information, so I created the blog. What made you decide to relocate to Paris? I received an offer to guest lecture wine courses at a business school for a semester in January 2014. I taught Luxury Wine & Spirits and the Kaleidoscope of European wines. Since there was nothing holding me back, I packed one suitcase and hopped on a plane. How long did it take you to get adjusted as a black woman from the US? I’ll let you know when I’m adjusted! Lol! But I will say that linking up with the Black Expat group in Paris really helped me out a lot when I first moved here. What sparked your interest in becoming a sommelier? A conversation with a winemaker. I was attending a wine festival in Virginia and became fascinated with this one wine, and the winemaker happened to be the one pouring it. As he explained his techniques to me and why the wine tasted the way it did, I kept asking him questions... like holding up the tasting line asking questions! After that conversation, I just had to learn more! So I started taking classes. I only wish I had known this would be such a turning point in my life, I would’ve remembered the wine and winemaker’s name! What do you think is the most common misconception about wine? Red wine – red meat; White wine – fish. Those are great general guidelines to start, but please don’t treat those as ‘the rules’. Salmon & Pinot Noir is an amazing pairing…don’t miss out on something great that your tastebuds will enjoy. If there was one tip you’d give those looking to get deeper into the world of wine, what would it be? Don’t try a varietal/style once and write it off. Wines taste different year to year and region to region. California chardonnay not your thing? Try Chablis from France and so on. What’s it like to work in a field where you are one of few as a black woman? But I also stand out. I’ve watched people cross the room to talk to me. Most just want to know who I am, what do I know, how much do I know. And they will remember me, being one of a few (especially here in France) and I use that to my advantage, and that’s what’s important. Girl Meets Glass is everywhere!! Take a sip with Tanisha! 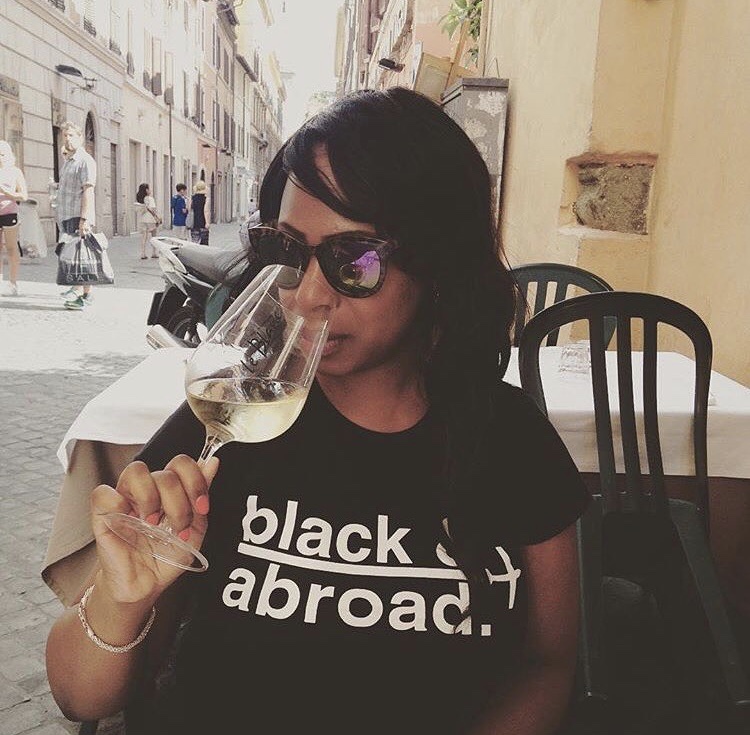 Join Tanisha as she co-hosts an amazing Black history tour and wine tasting experience on July 13th at 4pm & 6pm or July 16th at 4pm during AFROPUNK weekend in Montmartre, the heart of black Paris.